Ourisman Volkswagen of Bethesda is your premier Volkswagen dealership. Our Volkswagen dealer is a great place to find your new Volkswagen vehicle like the Volkswagen Beetle or Volkswagen Passat. Our sales team will work with you to find the vehicle that is right for you. You will not be disappointed in our selection of new and used cars near Washington, DC. Ourisman Volkswagen of Bethesda makes it easy for you to purchase a car online. You can look through our inventory from the comfort of your own home and complete the purchase process with the assistance of our friendly and knowledgeable staff. Once you've obtained your dream car through our website, we'll deliver it right to your door. If you want to learn more about Ourisman Volkswagen of Bethesda, you can do so by visiting our website. There, you can find out plenty of information about any of our service. This includes car leases and the auto repair our service department provides. You can give us a call at 844-327-9450. You can also come into and talk to us in person at 7001 Arlington Road, Bethesda, MD 20814. We pride ourselves on giving you the best customer service possible. Our new Volkswagen vehicles are of high quality at Ourisman Volkswagen of Bethesda. 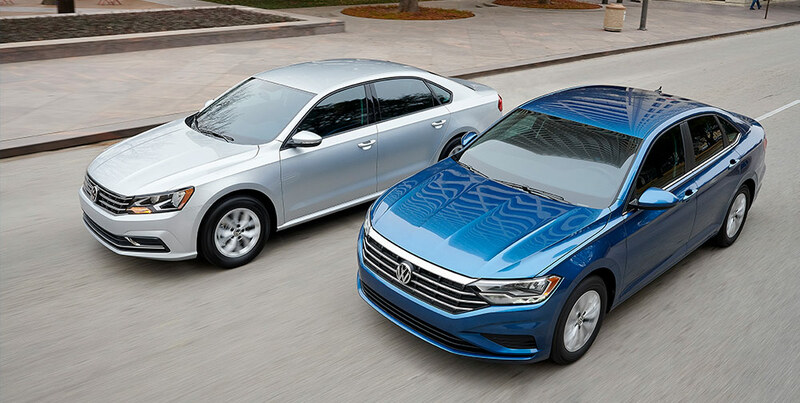 We love helping our customers find vehicles like the Volkswagen Jetta, Volkswagen Passat, and Volkswagen Atlas. Regardless of whether you are looking for a mid-size sedan or a sports car, we will find a Volkswagen model for you. You can figure out what you want by looking through our online inventory. From sporty vehicles with a hands-on manual transmission to roomy, family-friendly options, Ourisman Volkswagen of Bethesda has it all. Bethesda, MD drivers can make an appointment to take one of these new vehicles for a test drive today. The inventory at Ourisman Volkswagen of Bethesda also has plenty of quality used and Certified Pre-Owned vehicles to choose from. A new Volkswagen vehicle isn't always the right fit for every driver. If a used car is more your speed, we've got you covered. We are very proud of our great inventory of used cars at Ourisman Volkswagen of Bethesda. Not only are our used cars high-quality, they are also affordable. We make it our mission to have competitive prices on all of our used cars near Washington, D.C.
Ourisman Volkswagen of Bethesda also has many Certified Pre-Owned vehicles, as well. Before any vehicle goes into our CPO inventory, we make it pass our 100+ point dealer inspection. This rigorous inspection ensures that everything in the vehicle is working properly. This includes safety features like blind spot monitor and adaptive cruise control, to infotainment features like Apple CarPlay™ and Android Auto™. Any CPO vehicle will definitely work well for you thanks to this inspection. You can browse through our online inventory if you're interested in a used or CPO vehicle. We are sure you will find something for you. Once you've selected your vehicle, we can make financing a snap at Ourisman Volkswagen of Bethesda. Many Financing Options Available Near Washington, D.C.
At Ourisman Volkswagen of Bethesda, our finance team works to make buying or leasing your next vehicle as easy as possible. We offer many financing options, from auto loans that have low monthly payments to other options like a car lease. We understand that with a car lease, the monthly payment is one of your top concerns. That is why we can work our payment plans that are affordable for you. Even if your credit is not perfect, we do our best to find a great deal for you. You can even submit your financing application online no matter your credit score. If you have a car you want to trade, rest assured you will get the right value for the car. Trying to work with a leasing company can be a pain. That's why our finance team works with you so the financing is both simple to understand and affordable. The service department at Ourisman Volkswagen of Bethesda is top-notch. Our expert service technicians are very friendly and can answer your questions easily. They keep your Volkswagen vehicle running with standard maintenance like oil change service as well as more thorough service like transmission replacement. If anything goes wrong, bring your Volkswagen vehicle to our service department and our staff will handle it quickly. Of course, you can also get regular maintenance done on your Volkswagen vehicle by our service department. We know that many Washington, DC drivers like to fix things themselves. That's why we have a full-service Volkswagen parts center available with a wide selection of authentic Volkswagen parts. If you're having trouble finding what you need, our service staff is always available for assistance. In the event we don't have what you need at the moment, we can order the parts for you. We offer more than just vehicles at Ourisman Volkswagen of Bethesda. By choosing us, you are choosing to make your automotive experience fun and timely. Stop by our Volkswagen dealership soon to satisfy all your Volkswagen vehicle needs. Visit our service center at 5415 Butler Road in Bethesda, Maryland for all of your auto repair needs.